Do you think that Facebook censorship will be limited to a preacher, a Christian band and some Bible verses when the next big election is held in the US? The time to do something is NOW! As you read here and consider legal implications can you think of any reason that Facebook should not have registered as a PAC? 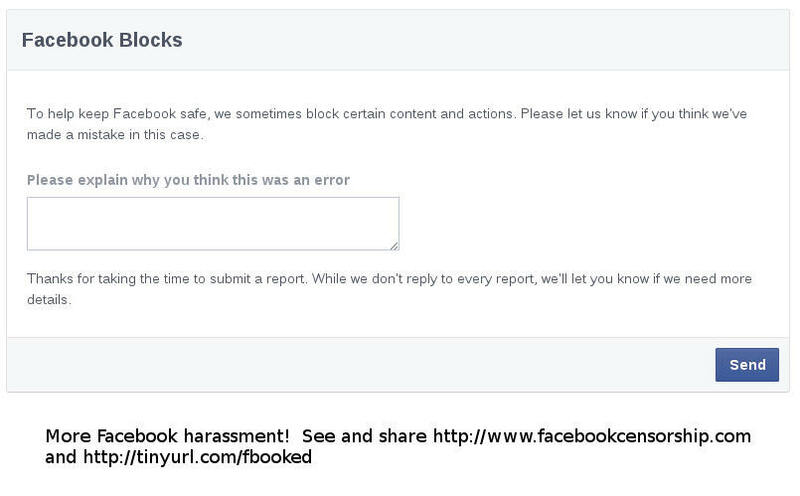 If you have been harassed, threatened or censored by Facebook BE SURE to SAVE A SCREENSHOT because that could be very helpful in any class action lawsuit. If you have a valid story please also share it here on our discussions page. Does not Facebook have any fiduciary duty to its members? There is an opportunity for the right law firm for a class action against Facebook. Public legal notice to Facebook. Civil litigation against you is being considered. The identities of those making frivolous spam complaints and all other complaints to exact censorship of valid postings, and the identities of the corrupt Facebook employees who are cooperating with them and harassing me and others with censorship and account disabling etc. may be required of you by the court through subpoena and your destruction of any of those records could be a criminal act, obstruction of justice. Does it bother you that I call the scum running Facebook "scum"? See if you can read to the end of this page without calling them scum too! Be aware if you use the Facebook social media plugin for comments to your site or blog that everyone that Facebook censors and blocks will be blocked from commenting your site too!! Do you really want to trust these anti-American, anti-Christian scum running Facebook to censor your comments section? More Facebook harassment 2/28/2015 The harassment is continuing into March when I try to comment and post links to this site. Feb 8 2015 The scum running Facebook are now blocking my ability to send private messages among many other things. This is pure harassment and beyond. Jan 31, 2015 -Facebook Announces It Will Allow User Mobs to Block Content From News Feed - HOW TO RESPOND! 1/21/2015 I logged onto Facebook only to discover that they had censored a rather mild reply to a truth hater AND that they were blocking me for posting for 30 days. I am more and more convinced that it will take legal action against Facebook to get this sort of thing cleaned up. Don't think because you get a lot of "likes" for your posting that you are somehow immune from their harassment. 1/22/2015 I have filed a BBB complaint #57312442 against Facebook. I am sorry to say that the Better Business Bureau is a hair shy of worthless, but maybe if more people would file complaints they might do their job. Another example of anti-American censorship by Facebook WITH some positive suggestions about action that you can take. 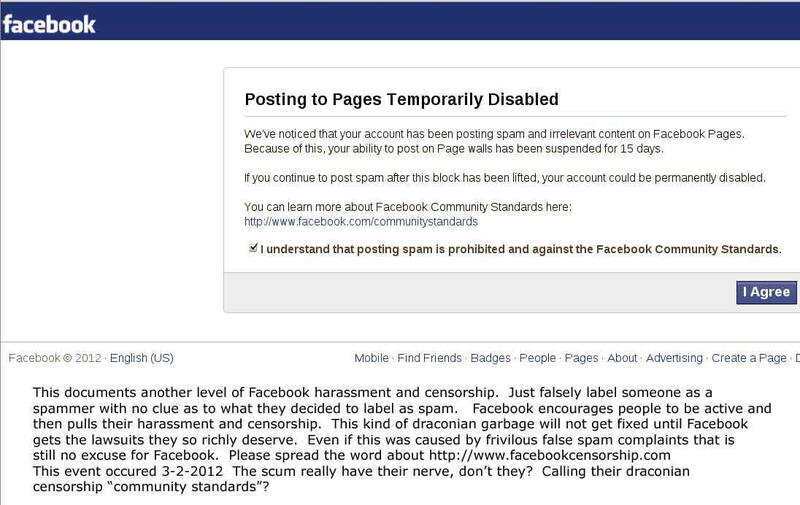 7-14-2014 The scum running Facebook are blocking me from posting to my own group because of the complaint of someone(s) who didn't like what I posted. Do not think that you have control over any group or page you have on Facebook. The scum will block you at their whim. To build a presence on Facebook is to build a house on sand! FINALLY a nice LAWSUIT being filed against Facebook!!! When I was blocked from Facebook I took some time to update our links and discussions area. Just when you think Facebook has "bottomed out" they just keep sinking lower and lower! When I clicked continue I was informed that I was blocked from Facebook for 12 hours. Please spread the word about http://www.facebookcensorship.com as they are getting worse and worse! Update 3-31-2013 WOW!! 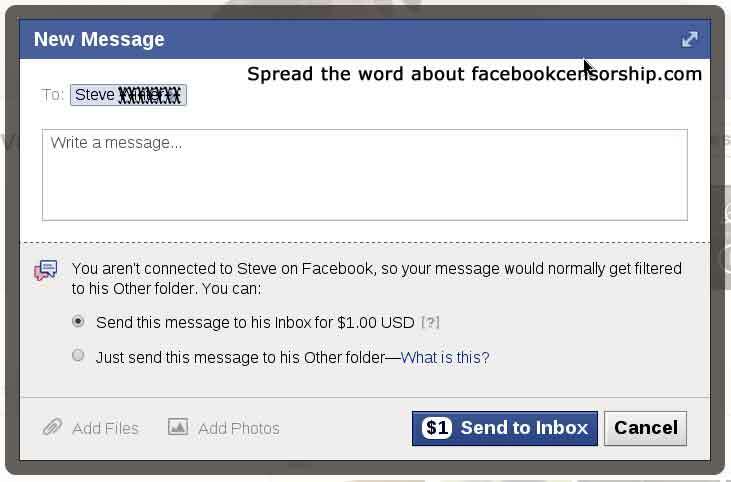 I just went to send someone a private message who was not on my "friends list" and the scum at Facebook wanted to charge me $1.00 to have the message go to their inbox, or it would just go to their "other" folder. Update 3-13-2013 The harassment continues and I am locked out again. What they do is make you pass a test to identify friends tagged in photos. Of course many tagged photos have nothing to do with the person tagged and many with hundreds or thousands of friends would not recognize every friend. That makes it easy for FB to harass and censor larger accounts. I don't believe the FB employees could be that stupid so I believe this is deliberate. There needs to be a class action lawsuit against Facebook. Then after a capcha and their "test" I get this next one. 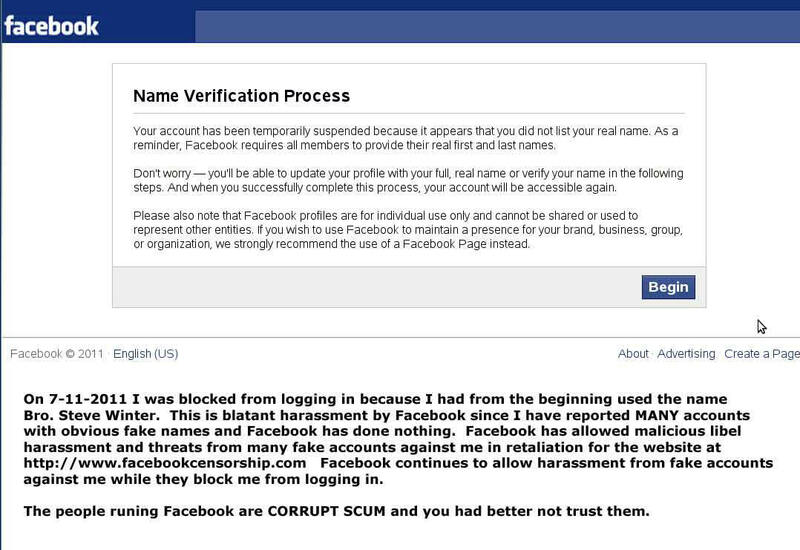 The scum running Facebook have hit a new low 2-28-2013 I have spent many months building groups and pages and a network of friends.. It really is getting to be time for a class action lawsuit. I am not sure how long this will last so PLEASE share http://www.facebookcensorship.com so that my friends will be aware of what is going on. As is documented here Facebook made me change my username from Bro. Steve Winter to Steve Winter not that long ago. This is nothing but harassment. Here is what I faced when I tried to access one of my pages. After confirming my name as Steve Winter I got this next one. I have noticed that the scum running Facebook are using a new technique for censorship. I try to post something to a page that had been advertised on my page and instead of the post saving I get a message asking if I want to reload the page without saving the message I was trying to post. Not only is Facebook censoring, they are using third world muslims AND revealing your personal data in third world countries. I experienced FBook harassment recently but nothing compared to this recent censorship of conservatives as reported by Fox News. Spread the word about http://www.facebookcensorship.com and share your story on the discussions page. Here is an interesting blog on examiner.com that even mentions this website. Facebook EXPOSED! This link documents some of the most insidious and blatant activity by Facebook! Have you noticed less on your newsfeed and less friend activity? Find out WHY! Here is an example of disgusting FB censorship. Worley is the one who published the addresses of a bunch of gun owners. 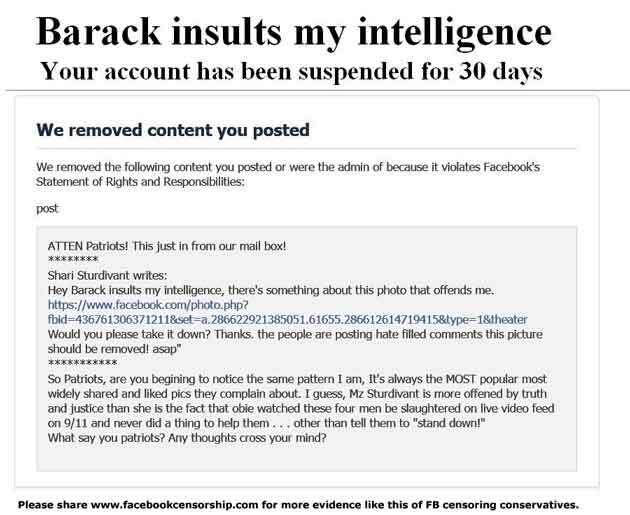 Update 10-28-2012 Here is a particularly egregious sample of Facebook censorship that we found. 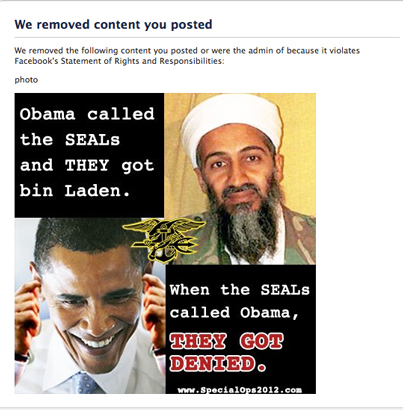 International news agencies are now publishing the story of Facebook CENSORING the SEALs. Update 10-8-2012 Just when I was beginning to think they had their act together Facebook has shown their malice and incompetence again. Here is a threat that I received when trying to post a reply comment to a post from a friend that appeared on MY HOME PAGE! Please share http://www.facebookcensorship.com on and off of Facebook. This demonstrates both Facebook's hypocrisy, and selective enforcement of their own rules that hopefully will support their legal liability. If you were harassed by Facebook and forced to change your name save this information as evidence for a class action lawsuit. It documents their discrimination by their selective enforcement of their rules. Update 8-20-2012 regarding the fake account mentioned above. Just look at this garbage! It really will take legal action to clean up the malicious garbage and incompetence at Facebook. Below are three messages I received when I logged on Facebook today and the block message when I tried to post to a friends page and to a group where I am the admin. Please spread the word about http://www.facebookcensorship.com and post these screen shots since I am apparently blocked from posting. Update 8-2-2012 I received another threat the same as on 6-20-2012 when posting a comment to an ongoing debate with a false preacher. 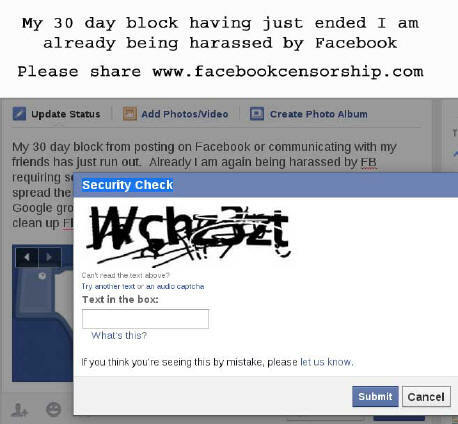 Please share http://www.facebookcensorship.com on sites and blogs outside of FB as well as sharing it here. Update 6-27-2012 I received another threat the same as on 6-20-2012 when posting a comment to a post that appeared on my own newsfeed on my own page. Please share http://www.facebookcensorship.com on sites and blogs outside of FB as well as sharing it here. Update 6-19-2012 I received the same harassment and threat as on 4-28-2012 by the scum running Facebook. This event is interesting because I was posting to my OWN group! Please spread the word about http://www.facebookcensorship.com and be sure to SAVE a SCREENSHOT when you are threatened or harassed by FB. That could be very important once a lawsuit is filed against Facebook. Update 6-13-2012 I again received the same harassment and threat as on 4-28-2012 from Facebook when posting a valid comment regarding a malicious stalker named Suleman Peter who is a polytheistic false-christian minister who is obsessed with me because my Bible studies expose him as a fake. Update 5-15-2012 I received the same threat again as on 4-28-2012 by the scum running Facebook. Please spread the word about this site! Update 4-28-2012 I received the threat below when preparing to make a valid comment. I believe that nothing short of lawsuits will clean up the scum running Facebook! Please spread the word about www.facebookcensorship.com and if you are threatened harassed or censored by Facebook be sure to save a screen shot and document it for possible legal action. A class action suit would be the best option. 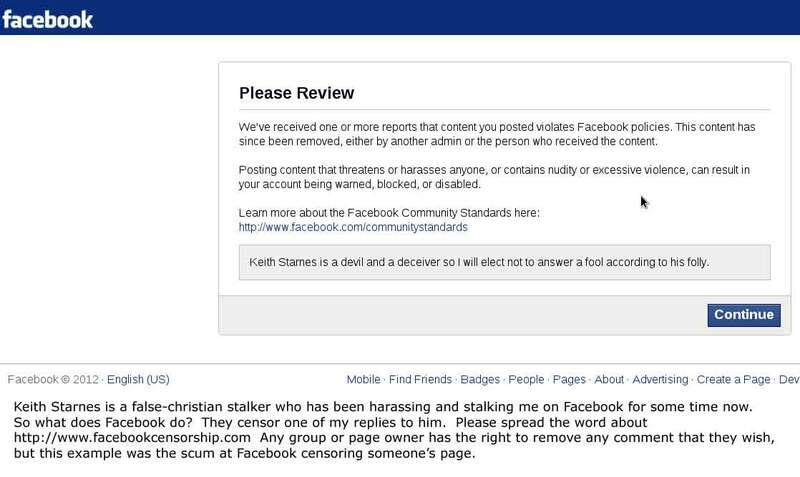 Update 4-15-2012 A false-christian deceiver named Keith Starnes has been harassing and stalking me on Facebook for some time, so what do the scum at Facebook do? They censor one of my replies to him. Update 4-8-2012 When posting a valid comment on a friend's page I received another threat from the scum running Facebook that if people didn't like my comment that my ability to comment might be suspended. Please spread the word about http://www.facebookcensorship.com Hopefully the events that I am documenting here along with supporting evidence will form the basis of one or more lawsuits against Facebook. Update 3-21-2012 I am being harassed with security CAPCHA to even post to MY OWN PAGE on Facebook. I am more and more convinced that it will take legal action to get this mess cleaned up. Please spread the word about this site http://www.facebookcensorship.com so that Facebook investors can be aware of what they are supporting and trusting. I believe that Facebook has a duty to those who built on their foundation due their apparently FALSE ADVERTISING and misleading representation of what Facebook really is! Facebook advertisers and investors need to be made aware of what Facebook is. 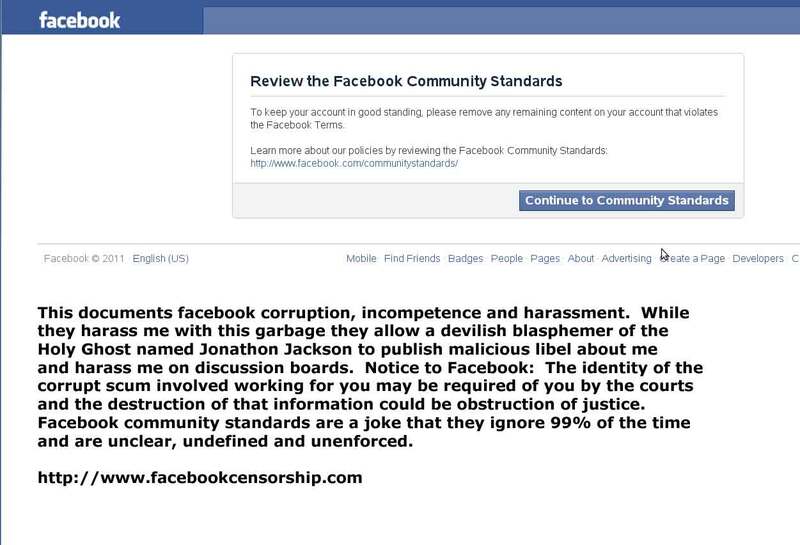 Update 10-28-2011 Facebook censorship, harassment and threats is getting worse. Here is the latest. Consider the blatant violation of their rules that Facebook allows for those who harass, stalk, and libel me. I believe this recent event was the result of an organized campaign by a reprobate devil named Jonathan Jackson (http://www.facebook.com/profile.php?id=100001540775943) who is obsessed with harassing and stalking me because I preach the truth, He has published malicious libel about me, many blatant lies and even boasted of his practice of organizing campaigns of frivolous complaints against me to manipulate Facebook. Update October 15-18, 2011 Facebook is KNOWINGLY and DELIBERATELY allowing obviously fake accounts like one named "Beard Buster http://www.facebook.com/beardbuster " to repeatedly publish malicious libel, copyrighted material of mine and lies about me. 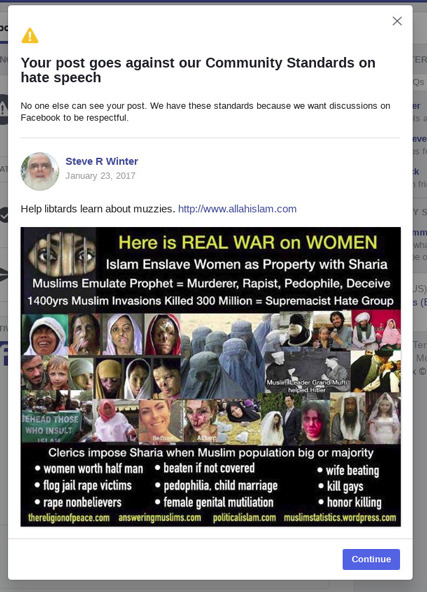 Spread the word about http://www.facebookcensorship.com There is even a scum posting as Al Einstein that was reported ages ago but Facebook ignores fake accounts while harassing real Christians and conservatives on minor technicalities. This further documents the corruption and dishonesty of Facebook. Update October 2011! It just keeps getting worse! After destroying groups so they could remove the discussion boards and making people start over with pages, Facebook is now REMOVING the discussion areas from pages!!! They are destroying years of peoples work to make it so they can censor easier. 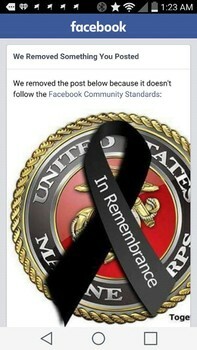 Update 9-28-2011 Facebook Censorship and hypocrisy have hit a new low even for them. Here are some screen shots. I had been harassed by a reprobate devil named Jonathon Jackson who even blasphemed the Holy Ghost and published quite a bit of malicious libel about me without Facebook taking any action. Update 9-9-2011 I have noticed that Facebook has removed the ability for me to email the members of an event that I set up within a group that I run. Their noose of censorship is tightening. They are changing things to make it impossible for a group owner of a large group to contact all of the members. Update 8-22-2011 I received two harassing emails from Facebook informing me that they had censored two of my posts in discussion groups. Meanwhile they allow false-christian filth to violate their vague TOS repeatedly and do nothing about it. This is nothing less than harassment and discrimination by Facebook. You will see below that Facebook FORCED me to change my username from "Bro Steve Winter" because they don't allow titles or fake names. Yet here are some sample fake name accounts of devils that have been reported to Facebook but after some time are still active. That proves what was done to me was harassment and discrimination. All of these new "improvements" and "upgrades" on Facebook are to centralize their CONTROL and CENSORSHIP abilities. It was for years the owners of a group that managed the content of a discussion board. NOW Facebook manages the content of discussion boards! Also note that the scum running the allfacebook.com page on Facebook are just as much scum as any of those running Facebook. It is amazing to me the hypocrisy of the scum running Facebook that they allow so much harassment from obviously fake accounts like a false-christian scum using the username "Praise Him" who has been sending me harassing messages (after being reported) and a plethora of others like that while they claim that they enforce real names only. They are lying scum. It is that simple. The trash running Facebook are LYING SCUM! See below how they have harassed me and made me change my username. Here is a link to documentation SCREEN SHOTS of Facebook DESTROYING AKA censoring years of peoples work by deleting ALL the members of their group and making them start over from -0-! Some of these people have invested YEARS of work and promotion based on Facebook's encouragement and advertising! I am also noticing that Facebook is planning to remove all the members of some of the groups that they are "upgrading". This is nothing more than brazen censorship. If Facebook does not get majorly sued before the next election the USA is in big trouble. I had also been for months documenting much of the information presented here on the Wall Street Journal Community but I just discovered that corrupt scum at the Wall Street Journal deleted most all of it. They deserve our deepest contempt. Consider what the scum at Facebook have done here. They KNOWINGLY allowed a fake "Steve Winter" account to be active for several days and allowed some stalker to post wherever he wished as me, using my copyrighted photo. THEN the scum at Facebook forced me to change my name from Bro. 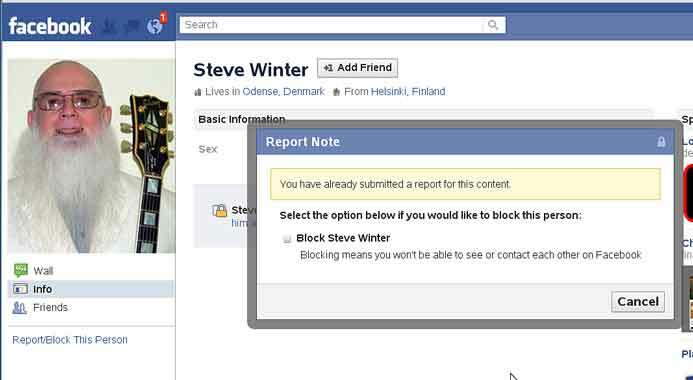 Steve Winter to just Steve Winter so NOW anyone looking will believe that I actually was the author of whatever offensive material the impersonator posted in the several days that Facebook gave him/her/it free reign to harm me as they pleased. If you have any doubt regarding what lying low life scum are running Facebook, do a search for Apostle or Pastor or Elder or even Jesus and see how many are using those as part of their Facebook name! July 7 2011 Facebook is again aiding and abetting criminal stalking. Someone setup a profile impersonating me here http://www.facebook.com/profile.php?id=100002591088127 and started sending me obscene harassing messages on Facebook that I believe are extreme enough to be criminal and a violation of Federal law. The fake account is still active several hours now after being reported to Facebook. If I file a criminal complaint I will be naming Facebook as a criminal accessory. Update July 9,2011, the low life scum running Facebook have still done nothing about the fake account impersonating me and violating copyright of my likeness. The account is still active. June 2011 ONGOING - This is really amazing! Facebook is aiding and abetting criminal harassment as retaliation against me. It is also notable that Facebook is deliberately allowing stalkers (including one Carl Mccaskey who I have even filed criminal complaints against (See http://www.carlmccaskey.com ) to stalk me and repeatedly spam malicious libel which is a clear violation of their Terms of Service while deleting my replies. They censor what they want and allow blatant abuse when it suits their whim. They have also been censoring most of my replies to Carl Mccaskey where I point out his history of harassment and stalking. This is just one more example of Facebook corruption. Facebook is also allowing him to repeatedly harass me using the Facebook email system. If I file another criminal complaint against him I will be adding Facebook as a criminal accessory. 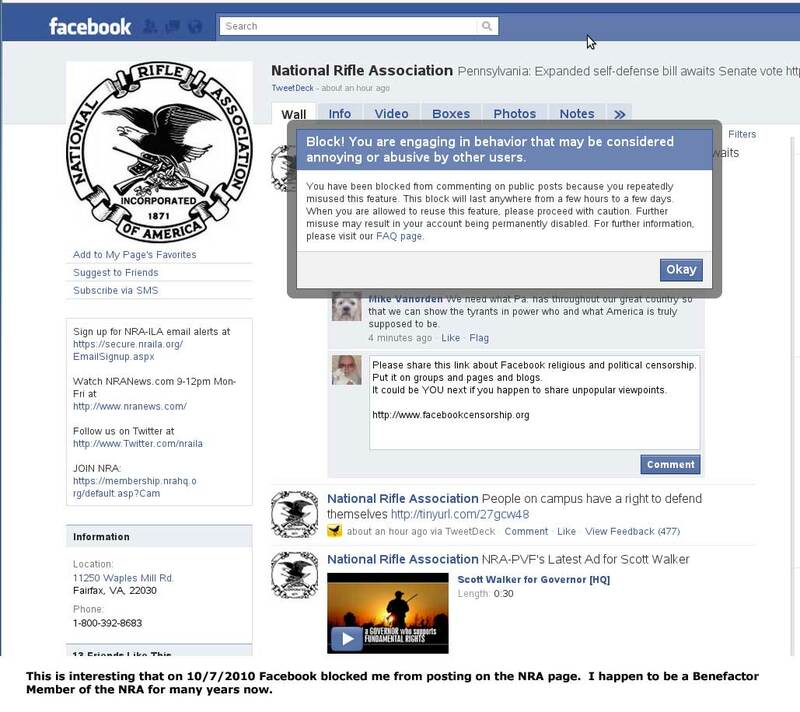 Here are some screen shots that document my claims regarding Mccaskey and Facebook's aiding and abetting. Update 5/6/2011 The basic destruction of established groups by Facebook by their new "upgrade" has the effect of destroying months if not years of work of those who built groups on Facebook. They have destroyed the ability for the admin to mass email the membership, but made it so every wall post spams everyone in the group a private message AND they have done away with the entire discussion area making the new "group" little more than a wall. This is one of the most destructive acts of censorship yet and proves that Facebook CANNOT BE TRUSTED! Update 4/15/2011 Check out the latest islamic death threat against me and my family. UPDATE 4/6/2011 see details below. 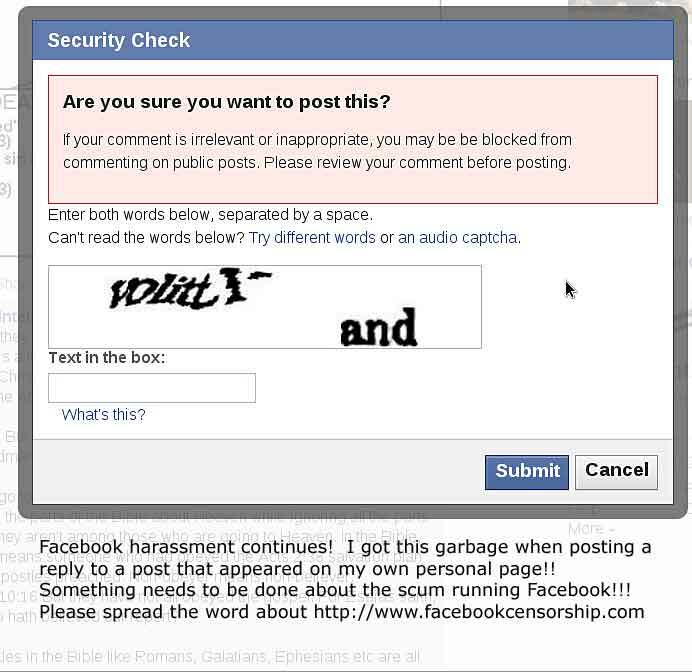 Facebook was actually censoring/blocking Bible verses from wall comments. Political and religious censorship on a site like Facebook should be a concern to all regardless of political or religious leanings. Facebook is lying when they claim that legitimate, on topic, comments are abusive just because they or a handful of members disagree with the viewpoint being expressed. 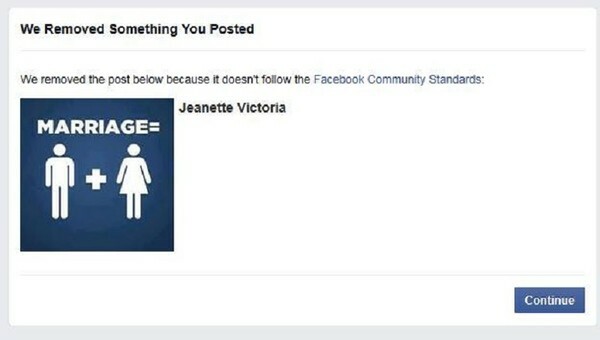 At the same time that Facebook is engaging in censorship and harassment against me for posting my opinions they are KNOWINGLY allowing harassment and libel to be published about me often from anon accounts AND knowingly allowing malicious distorted altered copies of my copyrighted likeness to be published from an obviously fake account as well as allowing a group clearly labeled for the purpose of defaming and harassing me to exist. Also Facebook is knowingly allowing "get rich quick spam" and such like even though I have reported it. Facebook is knowingly allowing the publishing of malicious libel about me from obviously fake accounts while they censor my valid content. It is becoming clear that nothing short of a lawsuit will clean up the mess at Facebook. They apparently have learned nothing from the lawsuits that they recently lost. I believe that the case could and SHOULD be made that Facebook has a fiduciary duty to its members who have built upon their foundation. One of the ways that Facebook abuses their position is to falsely label valid content as "abusive". The people running Facebook are corrupt and irresponsible. Even if the Facebook religious and political censorship is an automated result of people falsely "reporting" views they disagree with as "abusive", Facebook is still responsible for what they unleash upon their customers. Incompetence and laziness are no excuse for Facebook's failure as a fiduciary to those who believed their advertising and built upon their foundation thereby making Facebook rich and powerful. If their system is allowing automated censorship of unpopular viewpoints by those who disagree that makes it even worse and shows gross negligence by Facebook! Want to share your story? Click here for discussions and blogs about Facebook censorship and our comments area where others testify of being censored by Facebook. Seriously, is Facebook run by scum or is Facebook run by scum? 6-26-2011 After enduring several days of the scum running Facebook allowing a stalker named Carl Mccaskey (see http://www.carlmccaskey.com ) to blatantly spam malicious libel duplicate posts while deleting my replies, I believe that Facebook has hit a new low even for them. I have just had several of my posts to MY OWN DISCUSSION AREA on my own PAGE just disappear. I have felt that one of the reasons that Facebook destroyed the existing groups and removed all the old discussion areas was to move everyone to a format that they could more easily censor. Facebook censoring a page owner on their own discussion group is a new low and even greater cause for alarm. 5-6-2011 There is serious concern about Facebook changing their "group" format. Some feel that Facebook is basically destroying groups that took years to build. The instability of Facebook is manifesting in many different ways and a lot of people are growing more and more concerned. 5-1-2011 The Facebook censorship of wall comments is continuing just as before with valid comments being blocked from walls. 4-24-2011 I was able to post a few comments with Bible verses today that were still there when I checked back. At least some of the Facebook censorship seems to be subsiding. 4-23-2011 I tried to post some Bible verses on a wall comment on a Christian group that I am the admin of and the Bible verses were auto deleted from my comment when it was saved. I am amazed that there is not more outrage about what the corrupt filth at Facebook are doing. 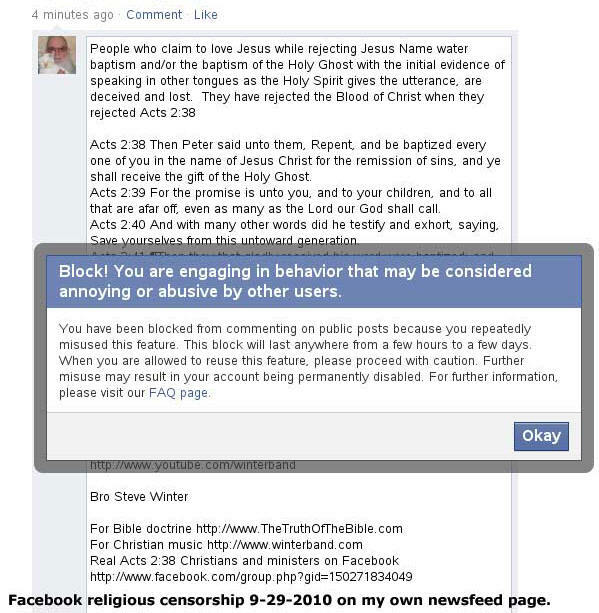 4-21-2011 The bumbling malicious filth running Facebook are continuing to censor Bible verses from wall comments. I tried to comment on a friends news post to my wall and the comment was blocked. 4-17-2011 Facebook censored the text below that I tried to post as a comment to a friends news post ON MY OWN WALL to add to the discussion. I really believe that there is real opportunity here for the right law firm. Courier Times regarding the LDS. The real Jesus Christ of the Bible is Jehovah Saviour. 4-17-2011 Facebook is now censoring links to Christian Sermons on YouTube. 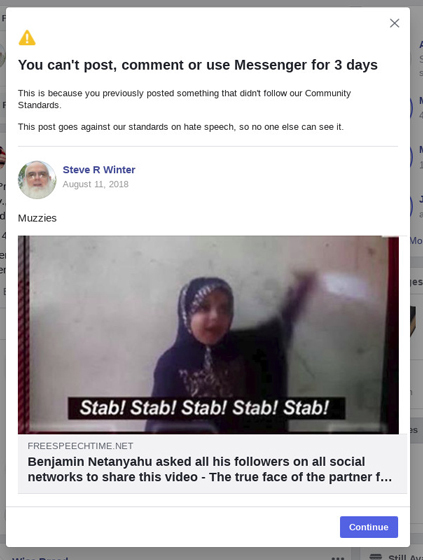 Facebook censored the following from my attempt to post a wall comment REPLY to a religious group news posting that appeared on MY Facebook home page from a group that I am a MEMBER OF. http://www.youtube.com/watch?v=4e6NB3Oq3VI Google video is discontinuing so I am moving some videos over to Youtube. Learn why trinitarianism is not merely stupid and foolish; but is actually an antichrist religion. 4-15-2011 Facebook seems to have no problems with death threats against me and my family while they continue to censor Bible verses and links to Winterband music videos from wall comments. I have created a new page to document the death threat thing. www.facebookcensorship.com/facebook_death_threats.html When I tried to mention which video had upset the young lady Facebook CENSORED this link here. http://www.youtube.com/watch?v=yUQrTMAdP6A The last time I checked nothing had been done about the death threat. 4-14-2011 The following was censored by Facebook when I put it as a comment to a news post that appeared on my home page from a group that I am a member of. I am hearing from others who have also been censored by Facebook. of FB actually censoring Bible verses from wall comments? I am NOT the only one this is happening to! 4-13-2011 In a religious discussion on a friend's wall I posted a comment with the following Bible verses. When I saved the comment these Bible verses were GONE from my comment! 1John 4:5 They are of the world: therefore speak they of the world, and the world heareth them. 1John 4:6 We are of God: he that knoweth God heareth us; he that is not of God heareth not us. Hereby know we the spirit of truth, and the spirit of error. Update 4/11/2011 The following was censored by Facebook as I tried to publish it as a comment to a Music news post that appeared on MY personal wall. Time to Die - Live At Stonehenge 2011?? Christian rock band sounding the trumpet for the end times. Update 4/10/2011 The following was censored by Facebook as I tried to publish it as a comment to a Christian news post that appeared on MY personal wall. cultists that is a problem. Update 4/9/2011 The following was censored by Facebook as I tried to publish it as a comment to a Christian news post that appeared on MY personal wall. Using the power of music for the Kingdom of God! 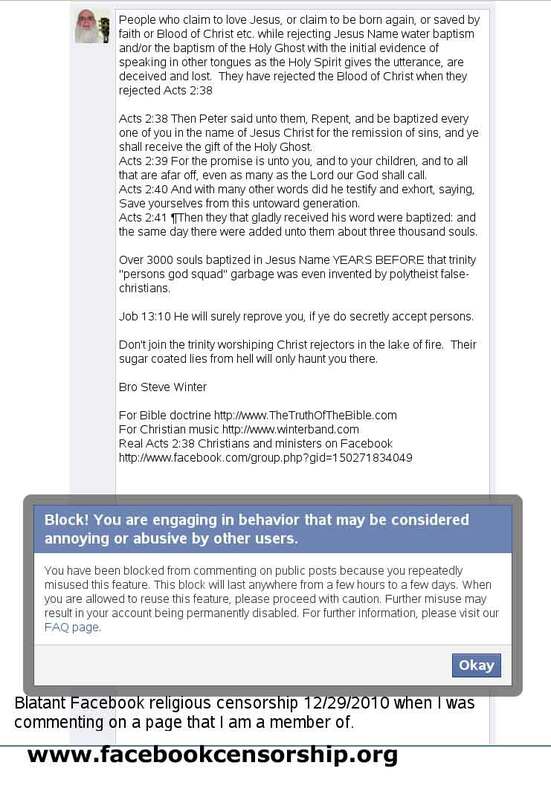 Update 4/6/2011 The scum running Facebook are now actually blocking/censoring Bible verses from wall comments. I tried to reply in a Bible discussion with the verse "Acts 22:16 And now why tarriest thou? arise, and be baptized, and wash away thy sins, calling on the name of the Lord." and it was CENSORED/BLOCKED by Facebook. The depth that these scum running Facebook are willing to go to has actually surprised me! Another Update 4/5/2011 The scum at Facebook are actually censoring/blocking the phrase "Christian rock by WinterBand" from wall comments. I really believe that there is a clear opportunity for the right law firm to make some money and also make the internet a better place. 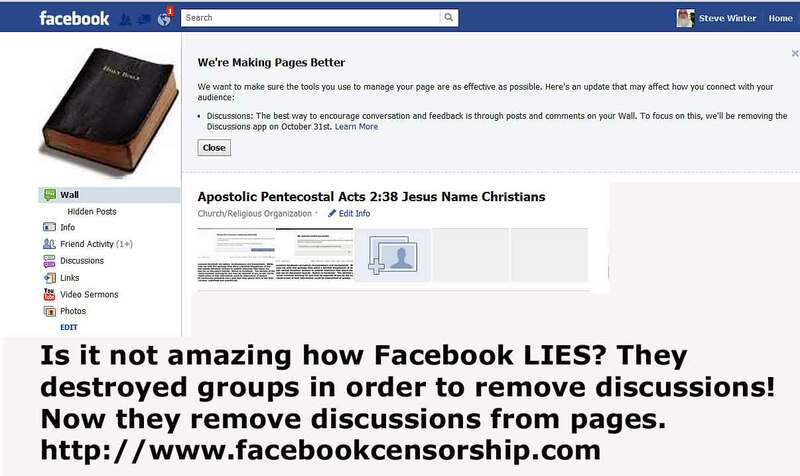 Update 4/5/2011 Wow, the scum running Facebook are now censoring even more phrases from wall comments that have to do with Facebook censorship as well as references to our Christian group as mentioned below. The scum are also allowing trash from fake accounts to freely spam group discussions with malicious libel about me. 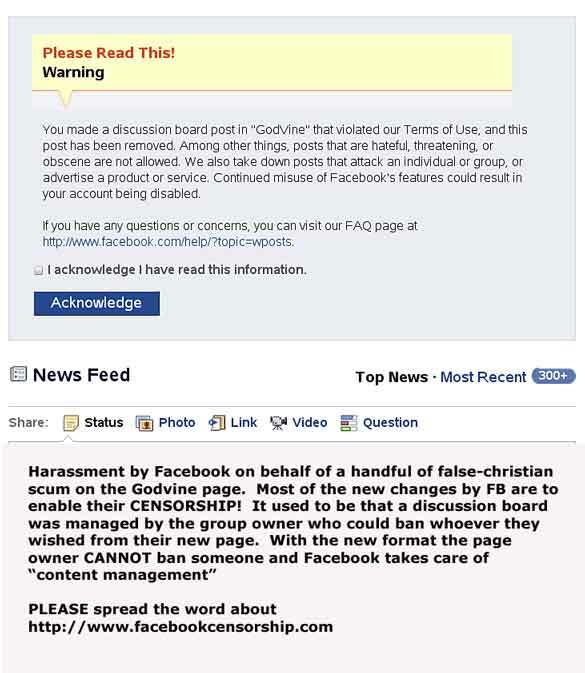 Update 4/3/2011 Wow, the scum running Facebook are now censoring the phrase "Real Acts 2:38 Christians and ministers on Facebook" from wall comments as well as www.facebookcensorship.org and who knows what else. My updates to the Wall Street Journal community about the censorship on FB are not updating to MY Facebook page either. Please spread the word about this site. Update 4/2/2011 Regarding the new more insidious aspect of Facebook censorship. 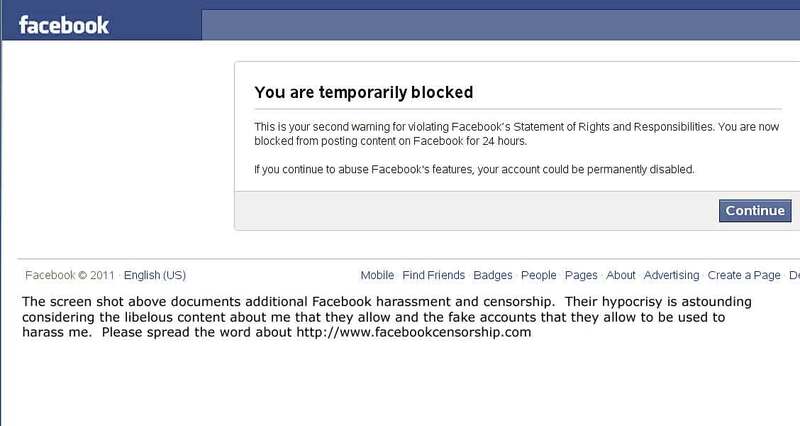 The phrase http://www.facebookcensorship.org is now being blocked from wall comments. Nothing short of a class action lawsuit is going to clean up the mess at Facebook. Update 4/1/2011 I have noticed a new more insidious aspect of Facebook censorship. Sometimes while leaving a comment to a wall post it looks like it is saving it but when you do a refresh of the page it is not there. No notice, no threat, the comment simply disappears. This is a valid Facebook group that I admin with almost 2000 members. Update 3/3/2011 It is very notable and might be of interest to any attorneys considering these matters that while censoring and threatening me from time to time, Facebook continues to allow fake accounts like "Satanloves Brostevewinter" to publish harassment and malicious libel and spam about me, harass me directly, and even spammed a group that I run in spite of having been reported to Facebook way earlier. Such clear cases of ignoring their own rules about fake accounts and real spam when they don't like the person being harassed may add a new legal aspect to the case. Update 3/5/2011 It is interesting that the trash running Facebook have still done nothing about the fake account Satanloves Brostevewinter (Steeve Satanicus) https://www.facebook.com/profile.php?id=100002187213732 that has been used to spam my group and harass me in other forums. Update 2/20/2011Wow, speaking of censorship the false-christian scum running the FB wannabe site called Freedom Torch where they falsely advertise their site as "where you can't be censored or deleted for loving America or standing for truth!" especially. Jonathan Cousar are some of the most vile and censorious false-christian scum I have ever encountered. . The scum Jonathan Cousar just banned me from there for preaching the truth (after allowing the false-christian scum there to accuse me of being muslim for teaching basic Bible that Jesus is God. What a lying, false advertising piece of scum Jonathan Cousar is! What a SNAKE PIT of false-christian filth that site is! 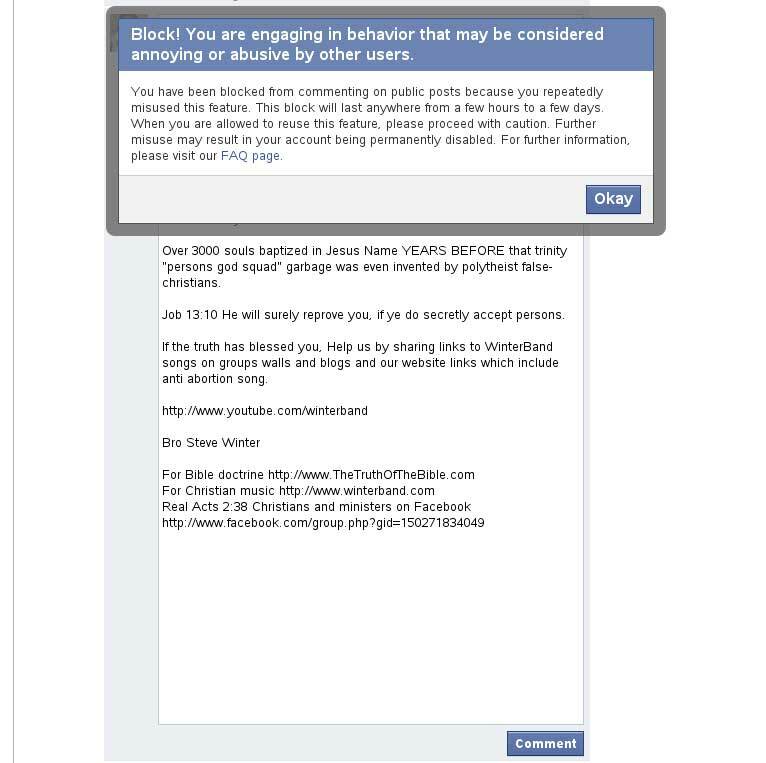 On 2/19/2011 I experienced another Facebook censorship event with the same popup as shown below in the other events, blocking me from posting valid religious content in reply to a wall posting. On 1/23/2011 I see that I am STILL BLOCKED from commenting on wall postings getting the same popup as displayed below with a false accusation of abuse. I am even being blocked from replying to comments directed at me personally. On 1/20/2011 I noticed my comments removed, AGAIN from my own video. On 1/19/2011 I noticed all of the comments removed, including my own, from one of my music videos that I had uploaded to Facebook. Some of the comments were very positive and I hated to lose them. I am the only one who is supposed to be able to remove MY OWN COMMENTS to MY OWN VIDEO! 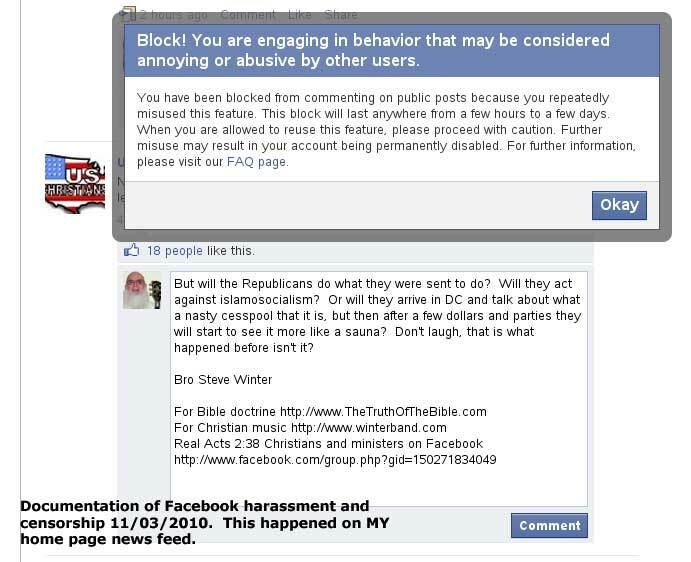 Here is a screen shot of blatant religious censorship by Facebook on 12/29/2010. I can understand why some false-christians would like to see information like this suppressed but Facebook encourages people to build on the foundation of Facebook, but then censors, harasses and threatens them. Does not Facebook have a fiduciary duty to those who believe their advertising? Update 12/27/2010 I have experienced yet another Facebook censorship/harassment event trying to reply to a news posting. I had not been particularly active in posting leading up to the event. Update 12/19/2010 I have again experienced Facebook censorship in some groups that I was a member of where they labeled valid content as "abusive". I believe that the case could be made due to Facebook's advertising and encouraging of individuals to build upon their foundation, ie to invest their time (and money in many cases) and the scope of Facebook's success in monopoly that a fiduciary duty exists between Facebook and its users or principals. The ongoing Facebook harassment and censorship could rise to the level of a violation of that legal responsibility. Update 12/18/2010 I was blocked from commenting on a post on a group that I am a member of. Apparently if a handful of people disagree with someone then they can get Facebook to block them by filing frivolous reports. That is not how it is supposed to work. If a group owner does not like someone they can simply remove them from THEIR group and delete anything they don't like. Facebook is engaging in blatant censorship and harassment. Update 12/17/2010 I was blocked from commenting on a CNN article that appeared on my home page. I have had other events that I had just attributed to Facebook incompetence but this time I got the popup threat that you see below. Update 11/2/2010 I was blocked from commenting on newsfeed articles on my own home page with the popup that you see below. Update 10/24/2010 I was blocked by Facebook from sending a private communication to a group that I admin on Facebook. I am not sure what content of the Bible study that they deemed "abusive content". I have also been experiencing other blocks and censorship by Facebook. I am becoming convinced that a lawsuit against Facebook would make the online world a better place. Update 10/16/2010 I was blocked by Facebook from sending a private communication with the link http://www.TheTruthOfTheBible.com because it was "abusive content". It is a link to a Christian message board. I am sorry to say that it turns out that the group US Christians on Facebook is run by false-christian scum who ban the truth from being published there because it would expose them for the ministers of Satan that they really are. Please keep in mind that these documentations below are portions of screen shots from my HOME PAGE news feed where I was blocked from commenting on posts that appeared on my own page in groups or pages that I was a VALID MEMBER of. Anyone with a group or a page on Facebook can ban anyone they disagree with so this is BLATANT FACEBOOK CENSORSHIP that you see here. You can see most of what I was attempting to post as a comment. Click here to go to the prime.org website.